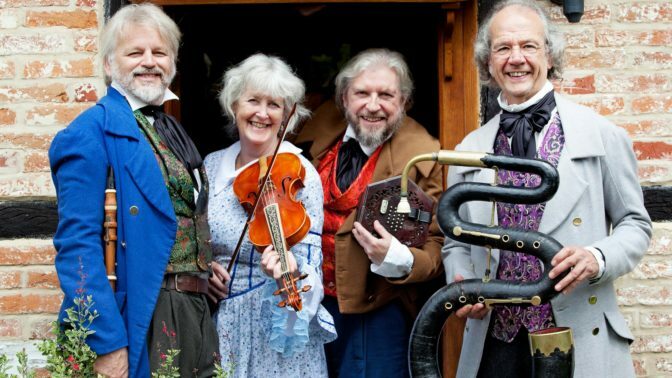 The Mellstock Band invite you to join them for a weekend of music and song from the West Country, as immortalised in the poems and novels of Thomas Hardy. For over thirty years Dave Townsend and the band have been resurrecting his musical world, finding forgotten gems of vocal and instrumental music from village musicians’ manuscript books and the early folksong collectors. Hardy and his family were active local musicians with their own collection of song and dance manuscripts, and Hardy noted down songs from his family and friends. In Dorset, as in most parts of England, for some hundred years from about 1740 onwards, groups of singers and instrumentalists played and sang in the gallery of their village church and went round the parish at Christmas to sing carols. Hardy describes a mix of powerful voices, strings and wind instruments, and the music is alive with vigorous rhythms, soaring counterpoint and strange harmonies. Don’t worry if you can’t read music or have never sung in a choir – we’ll go through all the parts and think about the best style for singing this vibrant tradition. As well as the tunes for dances, marches and songs, there are harmony parts which show how the old bands arranged and played their music, and so we can reconstruct the sound of a nineteenth-century village band. We will also include a dance workshop on the real Dorset dances and steps, including longways sets and reels. Alongside the church music, there are a range of convivial songs which were sung in harmony, some found in Hardy’s father’s song-book. The music can be performed effectively by almost any group of singers and musicians. Early accounts indicate that they were adapted to whatever forces were available, whether mixed or all-male groups, with the vocal parts re-assigned accordingly. Instruments regularly used at the time included violin, cello, flute, clarinet, oboe, bassoon and serpent. Free reed instruments, such as accordions and concertinas, and brass are also mentioned. The Mellstock Band entertain with a unique combination of singing, instrumental music and spoken word, encompassing west gallery harmony, traditional songs, glees, dances, marches, poems and stories. As well as performing their popular themed costume shows, they play for dances, present workshops and provide rural sounds for all kinds of public and private events. The Mellstock Band present the genuine sound of English traditional folk music – merry and majestic tunes, songs of love and laughter, carols and original harmonies.